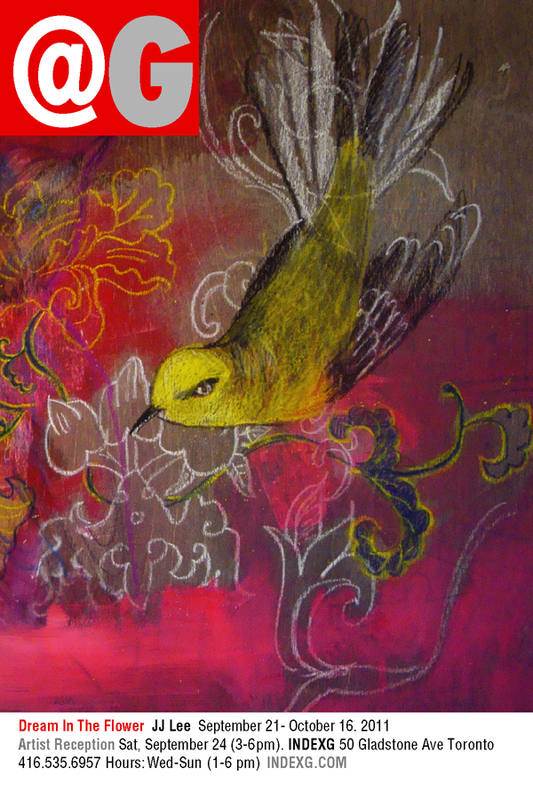 OPENING RECEPTION: Saturday, September 24, 2011 - 3 to 6 p.m.
Dream In The Flower is a series of mixed media paintings on wood panel, incorporating imagery from traditional Chinese patterning to Western ornithological diagrams to represent the direction of the contemporary, global world. Born and raised in Halifax, NS, JJ Lee received her Bachelor of Fine Arts from the Nova Scotia College of Art and Design in 1992. After living in Vancouver and exhibiting in Vancouver and across Canada, Lee pursued her Master of Fine Arts from York University, Toronto (1999). Lee has been featured in The Globe and Mail and ELLE Canada. She is the recipient of several awards, such as from the Canada Council, the Ontario Arts Council, RBC /Canadian Art Foundation’s New Canadian Painting Competition and the Asian Canadian Artists Fund for Visual Arts. She is represented in the Magenta Foundation’s Carte Blanche: Painting, a survey of contemporary Canadian painters. She currently lives and works in Toronto where she teaches at the OCAD University.